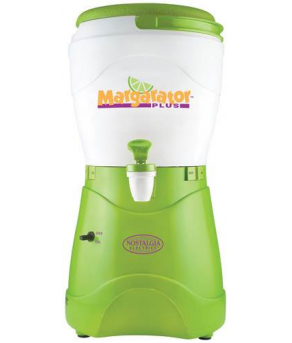 Easily make refreshing frozen drinks with this Nostalgia Electrics Margarator Plus MSB600 margarita machine, which features a dual swivel system that crushes and shaves ice for smooth drinks. The detachable blending chamber enables simple cleanup. Margarita and slush machineUses crushed or small ice cubes from your freezer to make refreshing frozen drinks.200W of powerProvides ample power to pulverize ice for your beverages.1 gal. insulated containerAllows you to make several drinks at once.Dual swivel systemShaves and crushes ice for consistently smooth frozen drinks.Cord storageEnsures neat and tidy storage.Detachable blending chamberProvides simple cleanup. GE - Profile 1.5 Cu. Ft. Mid-S..
Elite Screens - Tripod Series ..
D-Link - Wireless AC1200 Dual-..
Danby Designer - 4.4 Cu. Ft. C..
HP - Photo Card Pack Best Buy ..
eskuché - 45Sv2 On-Ear DJ Head.. Nostalgia Electrics - 1 Gal. M..
General Electric - Profile Ser..